Is Trump draining the swamp? "He's not draining the swamp; he's making it worse," yelled my bff on the phone yesterday during a long conversation in lieu of getting together--staying out of the cold and avoiding the ice. I had just told her that consumer confidence on Black Friday hit a historic high. We went through a lot of stuff, various topics and gossip but we kept coming back to HIM. She hates him like almost everyone I know hates him. I see him as a symptom. And a catalyst. If not, comic relief. A godsend of sorts. And I always feel compelled to defend him. Point out that every president did the exact same things he gets in trouble for, probably even worse. But they had much nicer personalities, and if they were nuts, they hid it. In other words, they were politicians. And he's a reality TV star. And I always try to explain the exact reason he got there: Democrats who had absolutely nothing to offer. The Democrats didn't flip the House. He did. Because he's so obnoxious--and absurd. The bully who keeps getting bullied. With the help of many Republican retirees who left open seats to fill, the House flipped because of revulsion. But it didn't flip anywhere near the numbers it had in other recent administrations. And he increased the senate by two. And unless the House phonies go crazy investigating him and impeaching him and otherwise antagonizing him, and doing nothing to make our lives better, he might be able to work with this new crop of people with new ideas about things like health care. And campaign finance reform--even though the Democrat senate leader takes in more icky cash than just about anyone in Washington, and won't want to cut off the gravy train for a second. And maybe none of the others will want to either once they get there. Which brings me to Republican Senator of Nebraska Ben Sasse, who is rather palatable to democrats--for a Republican. Who is on a book tour. He says the prime thing on everyone's mind in the House and Senate is keeping their job. So true. For that, they need lots of money from every nefarious source that's willing to give it. And publicity, I would add. In the form of ridiculous overblown platitudes and hollow attacks. Like calling ICE the Ku Klux Klan. Or calling yourself a Native American. Or Spartacus. Sasse says that's why he's in favor of term limits. He says what the Founders wanted was for regular people to come to Washington, do a stint of public service and then go back to being real people, not spend lifetimes in The Swamp. He says our problems stem from loneliness, because people aren't involved in community activities like coaching Little League games. People are getting too involved in politics, he says. Like this is a bad thing? Getting involved in politics. Like we should just ignore them and let them do whatever the hell they want? Like we do in Cook County? Which turned out so well. Is that what we want? True, I've often thought that election cycles, and even day to day political engagement has become a combat sport that inspires loyalty, argument, gigantic insults and someone getting hurt, at least emotionally. Whether it's around the water cooler or over a Thanksgiving dinner. But even if the grand design the Founding Fathers came up with included short stints in public service, and being regular people again, they still foresaw maximum engagement between the people and those serving. They didn't want people to ignore anything. And devote their time to needlepoint designs. They wanted people to make connections between the price of whale oil and what went on in the White House and the State House. The Founding Fathers foresaw plenty of news (fake and actual) coming out at a constant pace. And people reading, talking and devouring it just like we do today. 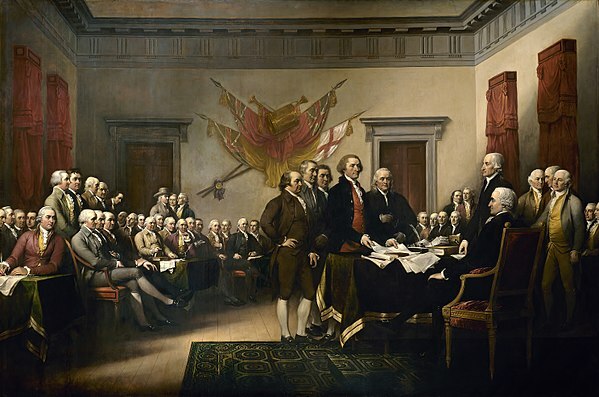 The Founders may have wanted everyone to have a balanced life--being regular interspersed with short stints in public service--but they damn well didn't want an ignorant populace, albeit a white male one, ignoring the affairs of the day. Which brings us back to Trump. And all eyes on him all the time, he telling it like it is, even when he's lying. Part of the schtick? We are witnessing a level of political engagement that we haven't seen since any other times but these: the identification of the Military-Industrial Complex, the Kennedy assassination, the passage of the civil rights bill, the Nixon Shenanigans, the Carter Experiment, the Reagan call outs, the first pseudo-invasion of Iraq, Monica Lewinsky, the second real-invasion of Iraq--and, finally, Obamacare. Turning points all. But Trump (as I said in this post after he got elected), even if he is terrible and destructive, at least he has everyone engaged. And ready to rumble in one way or another. If he can't be beaten for now, work with him. Ignore his idiocy and get something from him. From those who love the economy to those who hate the man, this is exactly what The Founders had in mind. It's not that we're lonely, or don't have anything better to do but watch Cable News. While we watch his antics, those like we've never seen, we must all think about what it means. Because something we did brought him to us. Trump's got that bright light shining all the time. On himself. Perhaps by serendipity, it's also on all things America. Trump's got us paying attention. He's a gift, because he's got us feeling like we can do something about it all. Which we can. And always could. And now we do. Whichever side we're on. It goes both ways, remember. He's got that bright light shining so bright and so hot now that the swamp might have no choice but to dry up. Or shrivel up like a Wicked Witch that had a house fall on her; or a bucket of water thrown in her face.